It is likely that a commercial building existed on this site (Resubs. 3-5, Sub. 2, Portion 28) from at least the early 1890s; early photographs reveal a cluster of buildings along the southern side of Redcliffe Road (now River Street) from the present site of the Petrie roundabout to the Old Dayboro Road intersection. A succession of greengrocers and fruiterers, most notably Jeremiah McCarthy and John and Esther Sargent, are thought to have traded from premises on this site. A photograph taken around 1910, during the occupancy of the Sargents, shows that the shop also offered “tea & coffee all hours”. Courtesy of Esma Ann Charlson. The property was transferred to John Neilsen on 3 April 1917. Neilsen was the first occupier of this site listed in the Queensland Post Office Directories from 1918/19 to 1920/21 as a storekeeper. 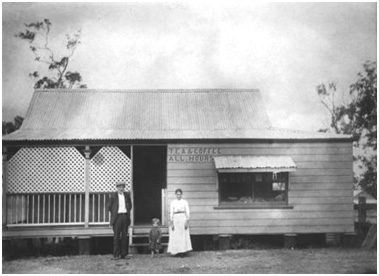 The general store was transferred on 17 January 1920 to Bert (Albert Edwin) Lack (1883-1926) who operated the business for five years before moving to Bald Knob near Maleny. Although he was only a resident in the district for a few years, Bert Lack is remembered for his contribution to the life of the town; in particular, he was a Vice President of the Pine Rivers District Brass Band during this period. 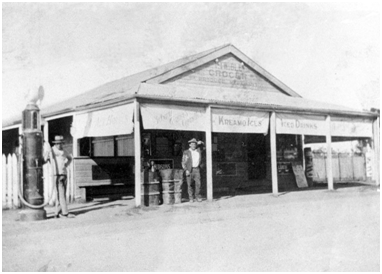 Pine Shire Council valuation and rating records indicate that Thomas William Twible (1877-1963) acquired the general store business after Bert Lack left the district. Twible retained ownership from 1 May 1925 to 26 April 1933, during which time the business became widely known as ‘Twible’s Store’. During the latter part of this period, however, it would appear that the store was managed by the Flux family, then the Senyard brothers, before Nelson Marshall Cooke purchased the property in 1933, briefly maintaining the store until the following year prior to constructing his new store next door. The old shop was demolished to make way for Cooke Street, and it is widely believed that some of the timber was used in the construction of Cooke’s new building.